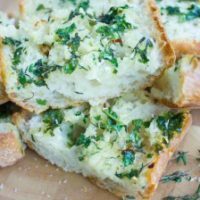 Make this easy Garlic Bread recipe once and I guarantee you will never reach for store-bought ones again! 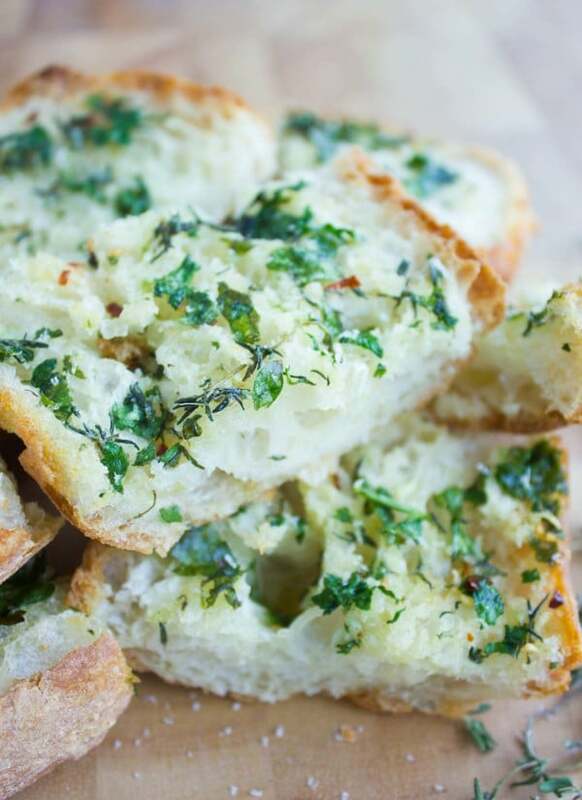 This homemade garlic bread is buttery, garlicky, crunchy and addictive thanks to my secret blend of butter, herbs and parmesan cheese! 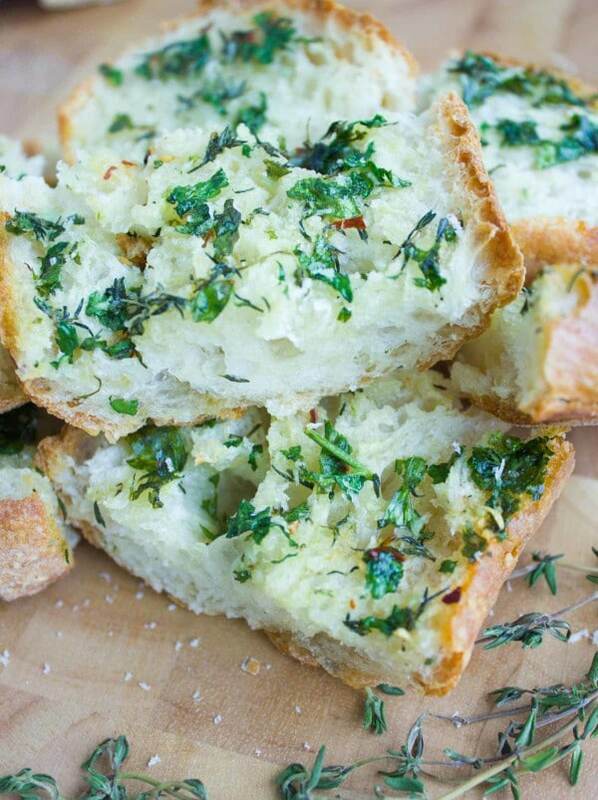 This is the ultimate easy garlic bread recipe for all you garlic bread lovers! 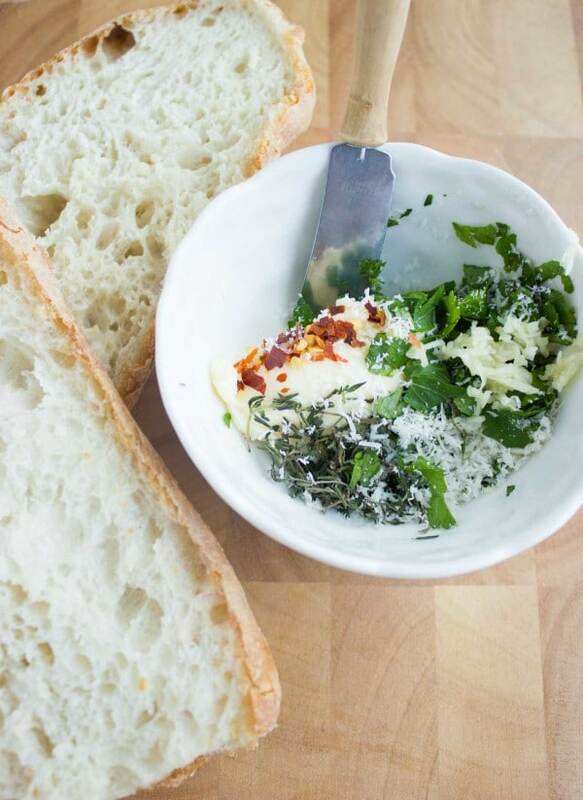 It starts off with your favorite loaf of baguette which gets smothered with a load of homemade garlic butter loaded with fresh herbs and Parmesan cheese and baked to your desired crunchiness! Just a few tips and tricks will help you customize this easy garlic bread recipe and make it your own ultimate garlic bread! 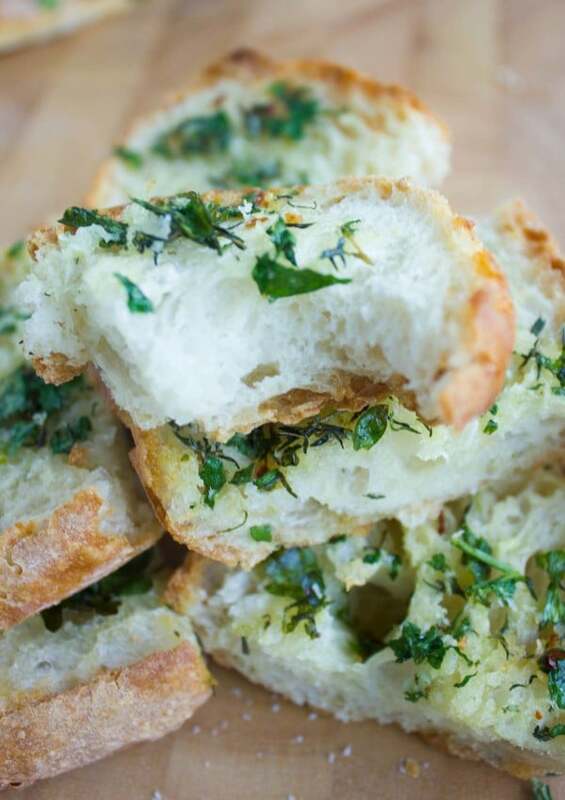 It is such a simple and quick recipe that requires no fancy ingredients or techniques, but one that is soooo important to have on hand—because let’s face it, we all have our garlic bread cravings once in a while! Let’s be honest, we all find ourselves craving butter and bread. And end up going for less delicious choices when we should really just have popped some homemade garlic bread into the oven. Right? So this ultimate garlic bread is the best in my book because it has my fave garlic companions. Butter, herbs, Parmesan and a touch of heat. Your ultimate garlic bread may have olive oil, one type of herb and no cheese or another type of cheese like blue cheese, goat cheese or good old mozzarella. Just to clarify, when I say butter, I really mean just a little bit of butter. And that’s the beauty of this easy garlic bread recipe, it’s completely adaptable to your personal taste. 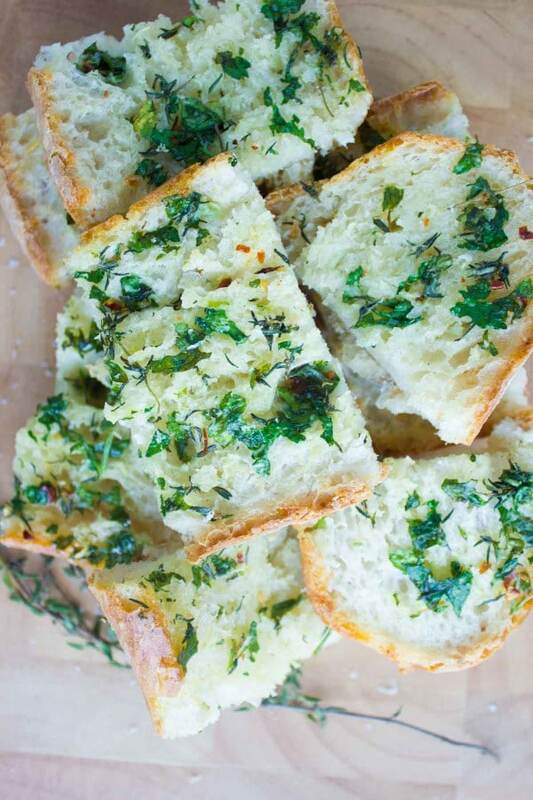 Now a word about the main component of this easy garlic bread recipe— the bread! I know many people who love their garlic bread on the soft side, while I know others who prefer it on the crunchy side. And then there’s those who love their Italian bread, while others prefer artisan-style bread. Again, the bread you use for this easy garlic bread recipe is entirely your choice—so pick your favorite or alternate for a different ultimate garlic bread experience each time! This time, I went with French baguettes because I love my garlic bread on the rather crunchy rustic side, and I slathered it with a mixture of a homemade garlic butter seasoned with mixed herbs, a pinch of red pepper flakes, a sprinkle of Parmesan cheese and salt and pepper! Slice the baguette into slices lengthwise but be careful not to go all the way, so that the slices are not loose and they are still attached to the base of the bread. In a small bowl, mix the butter, olive oil (if using), herbs, parmesan cheese, garlic, salt, and pepper. Take a pastry brush and dip it into the butter mixture then brush each side of the baguette with this homemade garlic butter. Repeat with the remaining mixture and baguette. When it comes to baking, it’s best to bake the garlic bread loaf as a whole covered in foil for 15 minutes, then uncover it and bake it for 5 -15 minutes longer (depending on how crunchy you prefer it). Then slice your easy garlic bread once out of the oven. I made this easy garlic bread recipe using olive oil and while it tasted great, I might have a slight preference for the butter flavor—just a slight. By baking the garlic bread covered for the first 15 minutes, you allow all the flavors to fully permeate the bread. Allow the garlic baguette to bake uncovered for the last 15 minutes to get the perfect crunch and to allow for the garlic to toast and loose its raw flavor. Leftover garlic butter can be stored in the fridge for up to a week or wrapped in the freezer for up to 3 months. Take a pastry brush and dip it into the butter mixture then brush with it each side of the baguette. Repeat with the remaining mixture and baguette. Wrap the whole baguette in aluminum foil making sure to seal it well, and place it in the oven for15 minutes until the garlic herb flavors are fully absorbed into the bread. At this point remove it from the oven and wait a few minutes for the foil to cool down before removing it. Break up the slices with your knife to serve the garlic bread or even better serve it whole and let everyone have fun tearing up their slice! If you prefer a crunchier garlic bread: After removing the foil from the baguette, place it on a baking sheet and return back into the oven to crisp up for 3-10 minutes. Allow the garlic baguette to bake uncovered for the last 15 minutes to get the perfect crunch and to allow for the garlic to toast and loose its raw flavour. This looks beyond delicious! Love the homemade garlic butter!